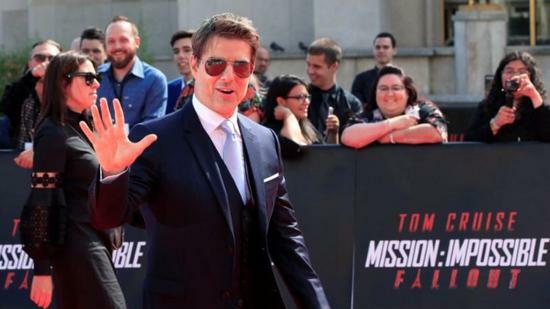 The sixth installment of spy movie franchise “Mission: Impossible”, which sees actor Tom Cruise leap from a military plane 25,000 feet above Paris, premiered on Thursday in the French capital. “Mission: Impossible – Fallout” tells the story of a mission gone wrong. Agent Ethan Hunt, played by Cruise, is hunted by assassins and former allies as he races against time to prevent a terrorist organization from provoking a global catastrophe. Cruise, who is known for doing his own stunts, also races a motorbike helmet-less through oncoming traffic round Paris’ Arc de Triomphe and pilots a helicopter though mountain ravines in Kashmir. Hundreds of fans queued for hours to see the actor arrive at a movie theater close to the Eiffel Tower. “I have been attending Cruise’s premieres for the past six years and it still has the same effect; I am just as happy,” fan Julia Margot told Reuters. Cruise told reporters that filming in the city had often been difficult. Rebecca Ferguson, returning as Hunt’s love interest – a government agent sent to track his enemies down – said she was happy women were involved in the action. “We shouldn’t bring women in films just to create an equality ... women need to be there,” she said. The film, directed by Christopher McQuarrie, will be released in movie theaters worldwide from July 25th. The first five “Mission: Impossible” movies have raked in 2.8 billion US dollars at the box office, according to Box Office Mojo, putting it in the top 20 movie franchises of all time.